This review is LONG OVERDUE as The Ballroom Bowl is one of my favourite bars in Toronto. Not only do they have great food, awesome staff and a variety of fun things happening and to do there, they also have lots of great deals! The Ballroom also hosts a bowling league and an event called The Throwdown (which happens quarterly believe), both of which are a LOT of fun and I have personally participated in. If you see these events, don’t think, just sign up as the Ballroom gives a ton of value for those that participate. To give you an idea, our bowling league cost $35/person and we got bowling for 6 weeks (2 hours at time) plus a free platter of nachos each time! 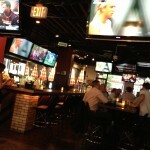 Ballroom also has some excellent drink specials and food specials that vary month to month. Currently, these include a daily soup and salad special for $6 before 4pm, several days with cheap drinks and $5 pints, and $45 mickeys of booze on Saturday nights. One of the reasons I love to go to The Ballroom is to watch sports. During several sporting events they typically add a drink special and have a lot of TV’s and big screens to catch the action. One thing I am very excited to check out is they are currently the official bar in Toronto for Bud Light’s Thursday Night Football games. 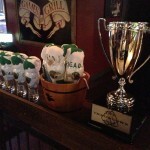 This means they will have all sorts of prizes, Bud girls, $5 Bud Light pints and (of course) the game on TV. If football isn’t your thing, they also do lots of stuff for Jays, Leafs and even Toronto FC games occasionally too. On the weekends, Ballroom is a great place to go and unwind. 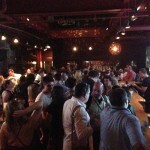 Friday and Saturday nights are usually quite busy when they have a mixture of DJs, live bands and NO COVER. If you don’t want the weekend to end, Sunday nights they offer FREE bowling from 5-close which is a lot of fun too! The menu at Ballroom is very much American style bar food. 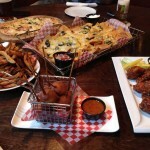 Nachos, wings, poutine, flatbreads, burgers and sandwiches take up most of the menu, with some other things in between. My personal favourites are the Chicken Caesar wrap, and the Veggie Burger, which I kinda stumbled upon by accident and really love! 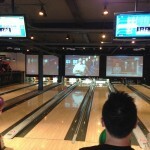 In conclusion, if you are looking for somewhere fun to go in downtown Toronto, you NEED TO check out The Ballroom Bowl. There is so much to do there, and if you plan your visit right it is a really amazing cheap place to hang out and have a lot of fun with friends. « When Is The Best Time To Do Holiday Shopping?